The Building, when viewed from the North side. 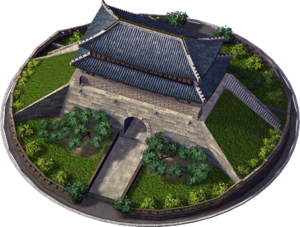 Sungrye-Mun (This name is incorrect, see Name section) is a downloadable Landmark Building for SimCity 4 Rush Hour/Deluxe, released as the Plugin Pack 009 free Downloadable Content. It is a recreation of Namdaemun in Seoul, South Korea, built in 1398, as it appeared before it was destroyed by fire and rebuilt. When Maxis made this landmark, they managed to give it more phonetically correct, but still incorrect names for every translation except Korean (where it is correctly named 숭례문). The name given for every language other than Korean for display in the menus is Sungrye-Mun; On the download page, it was listed as Nam Dae Moon; and in its Exemplar files, it is referred to as Lm64x64_NamDaeMoon_04B9. The formal name recognised by the South Korean Government is Sungnyemun, however the name Namdaemun is more well-known among Westerners and is used among some South Koreans to describe it informally. Even the Japanese, Thai, Traditional Chinese and Simplified Chinese translations, which are meant to use the localised character sets, are wrong; they list the incorrect English name. All languages except Korean use a duplicate of the English Description LTEXT file. When Maxis made the model, it was rotated roughly 180° from the direction it should face. In reality, the staircase was on the northern side of the gate, inside the city walls, but in the model it is on the Southern side. This page was last modified on 7 February 2014, at 06:51. This page has been accessed 14,619 times.